THIEPVAL, France – Friday 18 November 2016 was a date of solemn remembrances and stark reminders on several levels. Peter & Karen Dickens (representing the Royal British Legion UK Branch) and Andrew & Johanna Bergman (representing the SA Legion EU Branch) travelled to the Thiepval Memorial in Northern France for the Battle’s End – Last day of the Somme Ceremony. The first stark reminder was the date: We’d all been there previously in July to mark the beginning of the Battle of Delville Wood, which was only part of the much larger Somme offensive. That occurred with Legion and other veterans’ banners unfurled in brilliant summer sunshine. Now, as we approached the town of Albert, from where shuttle coaches would ferry guests to Thiepval, the windscreen wipers were struggling to keep up with intermittent late autumn showers, driven by an icy west wind. And all this time, 100 years ago, the battle had raged on, relentlessly and unforgivingly, for five months. As we arrived at Albert, and during the short bus trip to the memorial, there was a temporary lull in nature’s fury, and we dared hope the clearing in the clouds that let a brave sun through would hold. Well it did, for a while. The French State of Emergency dictated that all guests were pre-screened, and to the supreme credit of the Royal British Legion and Commonwealth War Graves Commission organisers, everything went like clockwork. The seating – placed in the approach to the arch, using the Memorial as an imposing backdrop, was designed so that everyone had a good view. The ceremony was moving and dignified, although punctuated by heavy gusts of rain-sodden wind. It was unavoidable to think how miserable the conditions must have been in the muddy trenches of 1916. 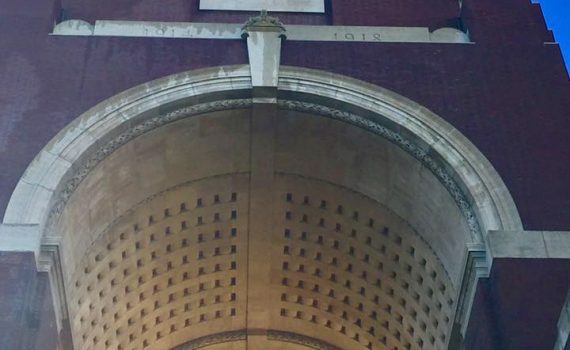 After the main ceremony, organisations and individuals were invited to lay wreaths and floral tributes at the Thiepval memorial arch itself. Peter Dickens laid a wreath on behalf of the Royal British Legion UK Branch, while I laid one for the SA Legion EU Branch. The return by coach to Albert station went as efficiently as our outward journey: Bravo Zulu to the Royal British Legion and Commonwealth War Graves Commission. The South African contingent then re-grouped for lunch at Le Tommy Bar in Pozieres, where we placed a South African Legion Shield among those of some of the Commonwealth’s most prominent regiments. It was an honour to thus pay tribute to the many thousands of men and women who fell or were injured in body or spirit in this terrible battle.